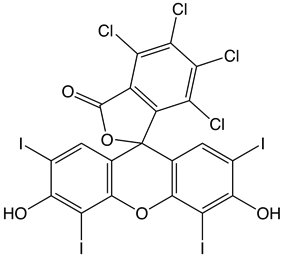 Rose bengal (4,5,6,7-tetrachloro-2',4',5',7'-tetraiodofluorescein) is a stain. Its sodium salt is commonly used in eye drops to stain damaged conjunctival and corneal cells and thereby identify damage to the eye. The stain is also used in the preparation of Foraminifera for microscopic analysis, allowing the distinction between forms that were alive or dead at the time of collection. A form of rose bengal is also being studied as a treatment for certain cancers and skin conditions. The cancer formulation of the drug, known as PV-10, is currently undergoing clinical trials for melanoma and breast cancer. The company also has formulated a drug based on rose bengal for the treatment of eczema and psoriasis; this drug, PH-10, is currently in clinical trials as well. Rose bengal was originally prepared in 1882 by Ghnem, as an analogue of fluorescein. Its name derives from rose (flower) and Bengal (region); it is printed as rose bengal or Rose Bengal in the scientific literature. 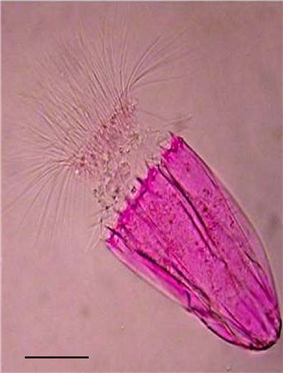 Optical microscopy image of the undescribed species of Spinoloricus from Loricifera stained with rose bengal. Rose bengal is also used in synthetic chemistry to generate singlet oxygen from triplet oxygen. The singlet oxygen can then undergo a variety of useful reactions, particularly [2 + 2] cycloadditions with alkenes and similar systems. Rose bengal can be used to form many derivatives that have important medical functions. One such derivative was created so to be sonosensitive but photoinsensitive, so that with a high intensity focused ultrasound, it could be used in the treatment of cancer. The derivative was formed by amidation of rose bengal, which turned off the fluorescent and photosensitive properties of rose bengal, leading to a usable compound, named in the study as RB2. Salts of rose bengal include C20H4Cl4I4O5·2Na (CAS 632-69-9). This sodium salt is a dye, which has its own unique properties and uses. PV-10 was found to cause an observable response in 60% of tumors treated, according to researchers in a phase II melanoma study. Locoregional disease control was observed in 75% of patients. Also confirmed was a "bystander effect", previously observed in the phase I trial, whereby untreated lesions responded to treatment as well, potentially due to immune system response. These data were based on the interim results of the first 40 patients treated in an 80 patient study. Rose bengal has been shown to not just prevent the growth and spread of ovarian cancer, but also to cause apoptotic cell death of the cancer cells. This has been proven in vitro, in order to prove that rose bengal is still a possible option in the treatment of cancer, and further research should be done. Rose bengal is also used in animal models of ischemic stroke (photothrombotic stroke models) in biomedical research. A bolus of the compound is injected into the venous system. Then the region of interest (e.g., the cerebral cortex) is exposed and illuminated by LASER light of 561 nm. A thrombus is formed in the illuminated blood vessels, causing a stroke in the dependent brain tissue. Rose bengal has been used for 50 years to diagnose liver and eye cancer. It has also been used as an insecticide. Rose bengal is able to stain cells whenever the surface epithelium is not being properly protected by the preocular tear film, because rose bengal has been proven to not be able to stain cells because of the protective functioning of these preocular tear films. This is why rose bengal is often useful as a stain in diagnosing certain medical issues, such as conjunctival and lid disorders. Rose bengal has been used for ocular surface staining to study the efficacy of punctal plugs in the treatment of keratoconjunctivitis sicca. Rose bengal is being researched as an agent in creating nano sutures. Wounds are painted on both sides with it and then illuminated with an intense light. This links the tiny collagen fibers together sealing the wound. Healing is faster and the seal reduces chances of infection. Rose bengal is used to suppress bacterial growth in several microbiological media, including Cooke's rose bengal agar. Rose bengal has been used as a protoplasm stain to discriminate between living and dead micro-organisms, particularly Foraminifera, since the 1950s when Bill Walton developed the technique. ^ Alexander, Walter (2010). "American Society of Clinical Oncology, 2010 Annual Meeting and Rose Bengal: From a Wool Dye to a Cancer Therapy". Pharmacy and Therapeutics 35 (8): 469–474. ^ Senning, Alexander (2006). Elsevier's Dictionary of Chemoetymology: The Whys and Whences of Chemical Nomenclature and Terminology. Elsevier. p. 344. ^ Kim, Y; Valentina Rubio; Jianjun Qi; Rongmin Xia; Zheng-Zheng Shi; Leif Peterson; Ching-Hsuan Tung; Brian E. O'Neill (2012). "Cancer treatment using an optically inert rose bengal derivative combined with pulsed focused ultrasound". AIP Conference Proceedings 1481: 175. ^ "Rose Bengal Sodium Salt". Sigma-Aldrich. Sigma Aldrich Co. Retrieved 12 November 2013. ^ Koevary, S (2012). "Selective toxicity of rose bengal to ovarian cancer cells in vitro". International Journal of Physiology, Pathophysiology and Pharmacology 4: 99–107. ^ Salber D, et al. (2006). "Differential uptake of [18F]FET and [3H]l-methionine in focal cortical ischemia". Nuclear Medicine and Biology 33 (8): 1029–1035. ^ Watson BD, Dietrich WD, Busto R, Wachtel MS, Ginsberg MD (1985). "Induction of reproducible brain infarction by photochemically initiated thrombosis". Ann Neurol 17 (5): 497–504. ^ Capinera, John L.; Squitier, Jason M. (2000). "Insecticidal Activity of Photoactive Dyes to American and Migratory Grasshoppers (Orthoptera: Acrididae)". Journal of Economic Entomology 93 (3): 662–666. ^ Martin, Phyllis; Mischke, Sue; Schroder, Robert (1998). "Compatibility of Photoactive Dyes with Insect Biocontrol Agents". Biocontrol Science and Technology 8 (4): 501–508. ^ Feenstra, R; Tseng, S (July 1992). "What is actually stained by rose bengal?". Arch Ophthalmol 110: 984–993. ^ Yokoi, Norihiko (2012). "Vital staining for disorders of conjunctiva and lids". Atarashii Ganka 29: 1599–1605. ^ Ervin AM, Wojciechowski R, Schein O (2010). "Punctal occlusion for dry eye syndrome". Cochrane Database Syst Rev 9: CD006775. ^ Chan, B; Chan, O; So, K (2008). "Effects of photochemical crosslinking on the microstructure of collagen and a feasibility study on controlled protein release". Acta Biomaterialia 4 (6): 1627–1636. ^ O’Neill A.C., Winograd J.M, Zeballos J.M., Johnson T.S., Randolph M.A., Bujold K.E., Kochevar I.E., Redmond R.W. (2007). "Microvascular anastomosis using a photochemical tissue bonding technique". Lasers in Surgery and Medicine 39 (9): 716–722. ^ Mulroy L., Kim J., Wu I., Scharper P., Melki S.A., Azar D.A., Redmond R.W., Kochevar I.E. (2000). "Photochemical keratodesmos for repair of lamellar corneal incisions". Invest Ophthalmol Vis Sci 41 (11): 3335–3340. ^ Proano C.E., Mulroy L., Erika Jones E., Azar D.A., Redmond R.W., Kochevar I.E. (2004). "Characterization of paracellular penetration routes". Invest Ophthalmol Vis Sci: 2177–2181.